may seem like numbers don't fit but they will come through. All members in good standing (dues currently paid) may submit up to 2 entries. The entry fee is $25 whether you submit 1 or 2 entries. Entries should be submitted via this website using form at bottom of the page. Upon submission, you will be linked to payment page (in store). Submissions not considered until payment is made. When submitting your entry (s), please designate whether you are submitting within the “Open” category or within the “Novice” category. The Novice category is only open to those with little or no experience in photo shows, and you may not have won an award in a previous SACC show. This is self-defined by the entrant, and there will be separate judging and awards for this category. Frames may not exceed 60x60inches. The frame is to be a black with white matt, with glass or plexiglass gallery style frame (no "museum" glass: frosted acrylic or non-glare glass). Canvas, metal, acrylic, and glass are NOT acceptable presentations. We are abiding with the gallery rules for this show. 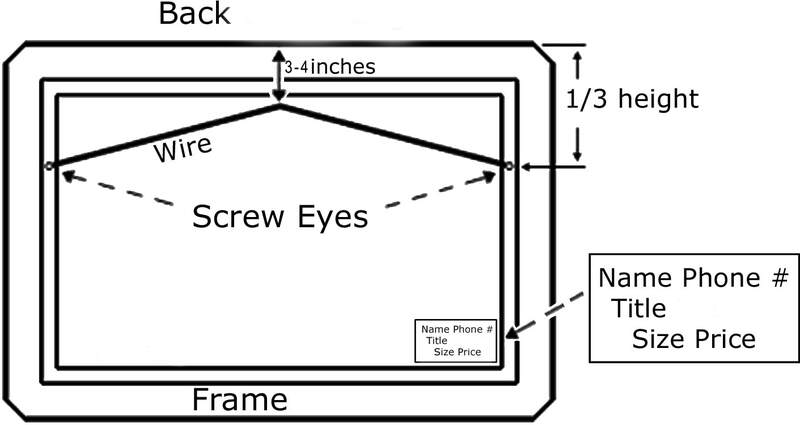 All entries must have a secure wire on the back with the top middle of the wire approximately 3-4 inches below the top of the entry when it is hung. No other hanger is acceptable. On the back lower right of your entry, please identify with the following information; your name, your contact phone number, the title of the entry, the outside dimensions of the entry, and the sale price. All entry photographs must have been taken within the past 3 years. Entry photographs may be manipulated by Photoshop or any other editing software. Entries may be in color or in black & white. SACC reserves the right to disallow an entry if it does not meet specified guidelines . In submitting your work as an artist, it is your responsibility to make sure appropriate permissions are obtained for use of an image. If a release is needed, you are responsible for obtaining it. The SACC and the StAAA will not be responsible for any damage or loss from any cause. Professional care will be taken with all entries. Amiro Art and Design gallery on Aviles St. in downtown St. Augustine has offered us 80% of their wall space for rent for the next three months. For July, August and September SACC will be able to hang pictures from the membership. The board has decided to do this on a first come, first served basis and will allow pictures that have been in any of the member shows to guarantee the quality and the uniformity of the display. This is a first come first served opportunity to show any picture that has been in any of our 5 member shows. if there are too many submissions they will be accepted based on the time payment was received. deadline for submissions is June 23.
payment page will be shown once submission button clicked. drop off and pick up time to be provided. 20% of all sales during the show go to The Amiro Gallery.